Tata Motors has signed a Memorandum of Understanding (MoU) with the Automotive Skill Development Council (ASDC), a Govt. of India recognized Skill Council for a collaborative skill development program in the automotive sector. This partnership will help Tata Motors’ skill development centres across its six plants in India and will comply as per competency levels of the NSQF (National Skills Qualification Framework). The MoU was signed in the presence of Mr. Gajendra Chandel, Chief Human Resource Officer, Tata Motors Ltd, and Mr. Sunil Chaturvedi, CEO, Automotive Skills Development Council with an objective to prepare our country’s youth by imparting & enhancing industry-ready occupational skills followed by assessment and certification on the basis of skill levels achieved and certified as per NSQF. The program will comprise of modules based on the skills for design, engineering, manufacturing, automobile production, sales & service as well in various support functions with a focus on quality, productivity, dexterity, discipline and safety. We are keen to see the Indian automotive industry becoming globally competitive with Tata Motors playing a significant role. In line with Government of India’s aggressive plans under the Skill India Mission towards ‘Kaushal Bharat – Kushal Bharat,’ we aim to contribute, positively to build India’s competitiveness. Launched on July 15, 2015 with an intent to train over 40 crore people in India by 2020, the Skill India Campaign complements not only mission “Make in India” but also to reap India’s demographic dividend by enhancing employability within India as well as in other countries. To support and make this a reality, the corporate partnership of Tata Motors with ASDC is a step in that direction. The automotive industry is a significant generator of employment in India. Till date, the ASDC has contributed to the development this industry by creating 188 Qualification Packs (QPs) comprising of 938 National Occupational Standards (NOS) related to automotive sector. 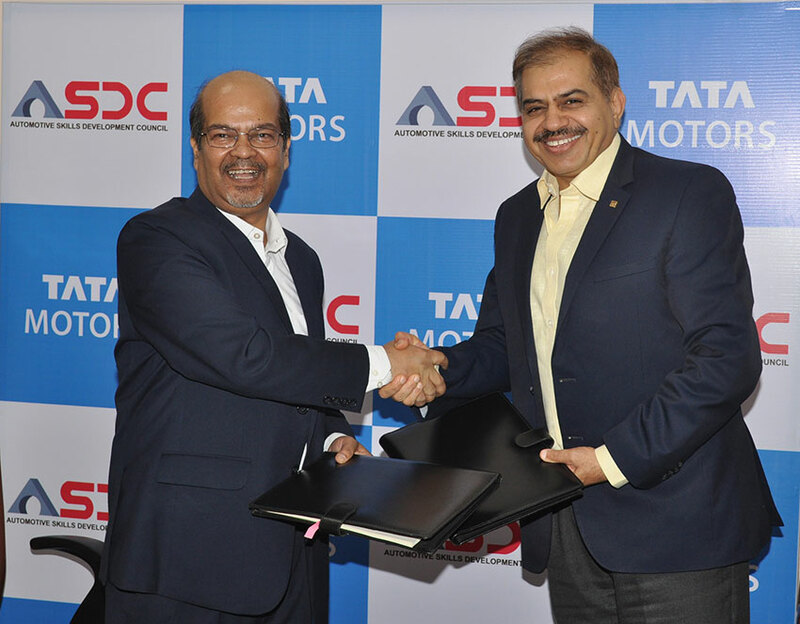 Tata Motors’ partnership with ASDC will further enhance the expertise in conducting research, developing training course curriculums and certification of trainers and students, in consultation with experts from the automotive industry and from academia.